Looking to get your foliage on? If so, there’s no finer spot than the state of Rhode Island. We’ve got a whole lot of awe-inspiring autumn scenery packed into our 1,045 square miles. 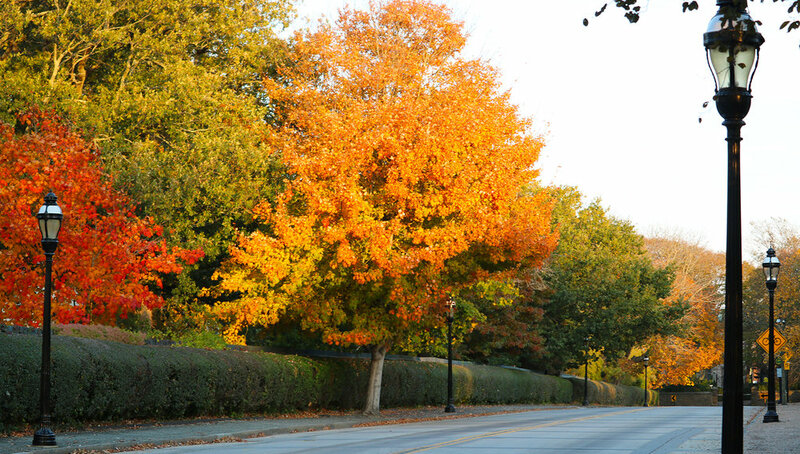 To help get you started, we’ve rounded up our favorite spots for taking in the fall foliage as the trees undergo their annual metamorphoses. Let’s count them down. Oft-dubbed the “gem” of Rhode Island’s State Parks System, this 464-acre sanctuary in Bristol offers visitors the quintessential New England experience. Amble along curving paths past gracious lawns and old brick walls before stopping for a picnic while taking in panoramic views of the Narragansett Bay. You might even catch a lucky glimpse of a bride or two at this uber-romantic wedding spot. Prefer a two-wheeled roam over a two-footed one? The park offers four miles of bicycle trails along the spectacular shoreline. It is the oldest lending library in all of the United States. Founded in 1747 under the principle of "having nothing in view but the good of mankind", its mission remains the same even after all these years. Discover the history of our wonderful country in a building that is truly like no other. Located near downtown Newport, the library boasts magnificent views of the season. It makes for a must-stop during a walking tour of Newport. Spanning 435 acres and nine miles of winding country roads, Providence’s Roger Williams Park Zoo is home to more than just a magnificent menagerie of animals including everything from eagles to elephants and red pandas to pythons. It’s also home to some of the region’s best scenery thanks to a breathtaking botanical garden, rolling meadows, garden after garden, and even a charming Victorian carousel offering $2 rides to both the young and young at heart. Don’t forget your camera: the Zoo’s Japanese garden offers one of the state’s most sought-after photo ops. Discover Rhode Island’s first multi-town bike path. Journey 14.5 miles from India Point Park in Providence to Independence Park in Bristol. Magnificent fall colors are on display every direction you turn. The preferred method of travel here is bicycle. We recommend making use of The Chanler’s complimentary’s bicycles to properly take in some of Rhode Island’s finest foliage. This four-acre urban park is the epicenter of Providence’s downtown area located near the junction of the Woonasquatucket, Providence, and Moshassuck rivers. Perhaps best known for playing host to the sensational WaterFire art installation, the park holds plenty of allure for leaf-peepers, including the tree-lined RiverWalk, not to mention transportive cobblestone pathways, plazas, and pedestrian Venetian-inspired footbridges -- all nestled within the bustling capital city. Feeling tired from all that walking? Consider taking in the sights from an authentic Venetian gondola instead. Providence is located approximately 45 minutes from downtown Newport. 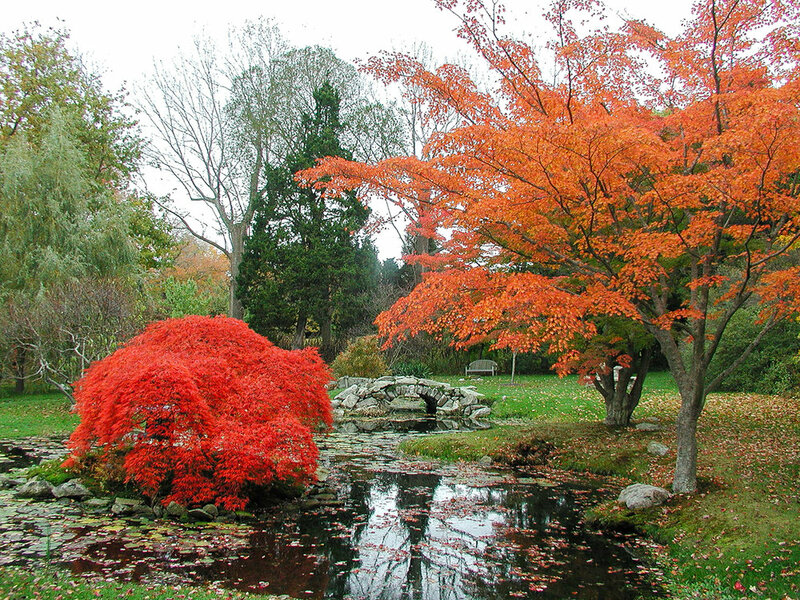 With 2,000 species of vegetation, trees dating back to the 1870s, and a “Great Lawn” -- once used for drying canvas sails -- looking out over Narragansett Bay, it’s not exactly a surprise that this local landmark was declared to be “one of the five best public gardens in New England” by Yankee Magazine. Explore the lavish grounds on your own; take an organized “Wednesday Walk-Around” or “Saturday Stroll;” or participate in an event, such as creating an autumnal tablescape or learning the techniques of proper stone wall building. Last on our list is the view offered from our grounds. Situated right on The Cliff Walk and within close proximity to Easton's Beach, these autumnal sights are truly unique. The vibrant colors can be seen as soon as you step foot outside the lobby or right when you enter through the front gate. If you’re pressed for time or don’t feel like traveling too far, The Chanler grounds offer that perfect slice of nature. The Cliff Walk, just a few steps away, has vibrant colors mixed with a rocky landscape overlooking the coastline. It is a unique sight that you must experience at least once.